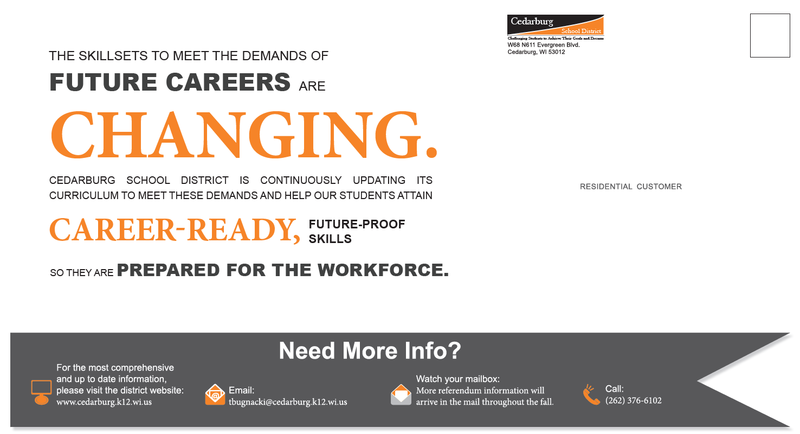 The School District of Cedarburg has a proud history of providing quality education for over 130 years. Our district consistently ranks among the top performing districts in the state and Midwest. This history of success is based on making decisions that reflect the community’s high expectations for excellence while demonstrating integrity and fortitude to do what is best for all. To continue this tradition of excellence, we must constantly assess our current and future academic needs. During the 2017 school year, the district engaged with over 500 constituents, conducted over 30 listening sessions and administered 6,700 community surveys to the six municipalities the district serves, to assess our needs. Through this process, the immediate needs were identified as capacity, teaching and learning, and safety and security. From enrollment to learning spaces to security, the "CSD State of the District" provides the facts around the immediate needs that our schools are facing. Residents receive a series of informational mailings along the Long-Range Planning process and regular updates leading up to the November 6, 2018 referendum. 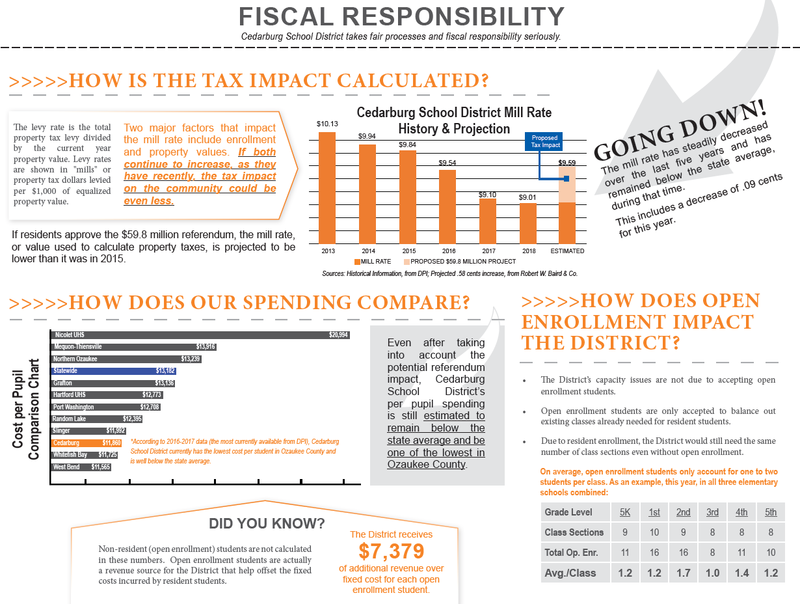 Referendum Fact Sheet & Project Overview: This mailer provides residents a summary of the need, overview of the project and overall cost of the plan along with key priorities for each school. Watch for this mailer the week of July 30. June 30 | Community Survey Results: A newsletter summary was mailed to all residents of the district headlining the survey results and next steps. 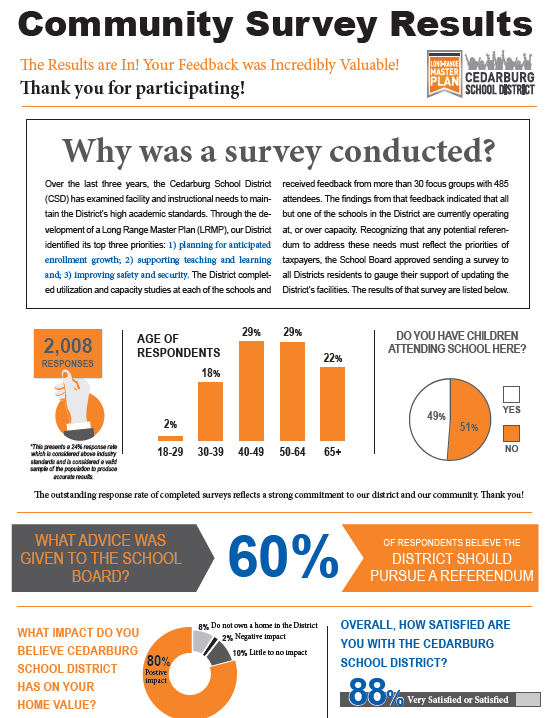 At the April 23, 2018 School Board Meeting, the Board approved proceeding with a community survey mailed to all residents of the Cedarburg School District. The school district asked residents to complete the survey to provide feedback. It provided details on the scope of the project that addresses the needs in every school building, in addition, it articulated the District’s needs, identified the potential plans for each school and provided costs while gathering feedback. We received an outstanding response that reflects a strong commitment to our district and our community. Thank you! 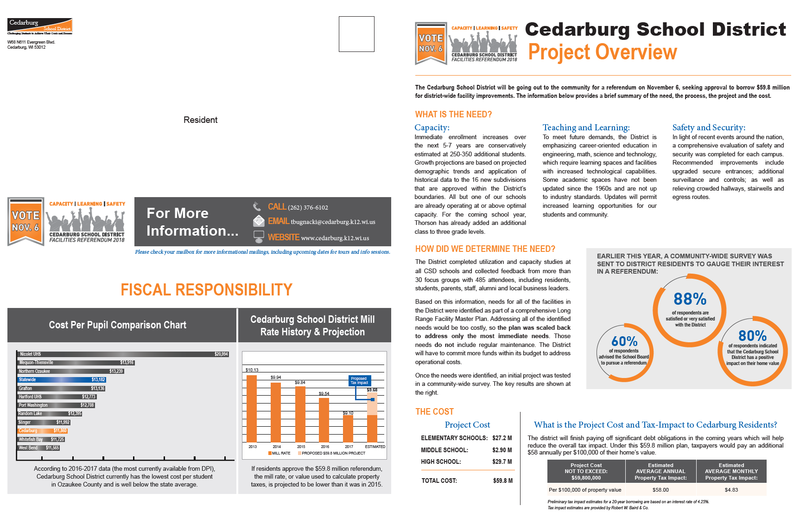 The survey showed 60 percent of the respondents would advise the board to pursue a referendum, in part, because 80 percent of those surveyed believe the Cedarburg School District has a positive impact on their home values. July 19, 2018 "BOE Approves November Referendum"
June 21, 2018 "Reduced-Cost Plan"
June 6, 2018 "LRMP Survey Results"
April 25, 2018 "CSD LRMP Community Survey"
March 5, 2018 "Cedarburg Elementary Schools Capacity a Key Component"
February 7, 2018 "CSD Identifies LRMP Needs"
January 26, 2018 "Building Capacity, Large Group Spaces, Traffic Flow and Safety Among Themes of Focus"
January 22, 2018 "Formulation of Options Begins"
January 16, 2018 " Business Leaders, Community Members and Alumni Engage"
December 18, 2017 "CSD Evaluates Building Utilization"
November 21, 2017 "Teachers First to Kick Off Process of Needs Discovery for LRMP"
October 31, 2017 "Cedarburg School Board OKs Facilities Planning Process"
October 27, 2017 "Cedarburg School Board gives Green Light to Community Input Approach for Facility Planning"
October 25, 2017 "Cedarburg School Board Approves Community Input Approach to Identify and Confirm School District Teaching and Learning Needs"
October 20, 2017 "Cedarburg School District to Use Community Input as part of Facility Master Planning"
October 27, 2017 "As we prepare our students for their future, we are asking you, along with teachers, parents, students, alumni, and community members to assist in developing a Long Term Facilities Master Plan.